There is a lot of work that goes into building each and every world Magic visits, both from the creative team and the rest of R&D. 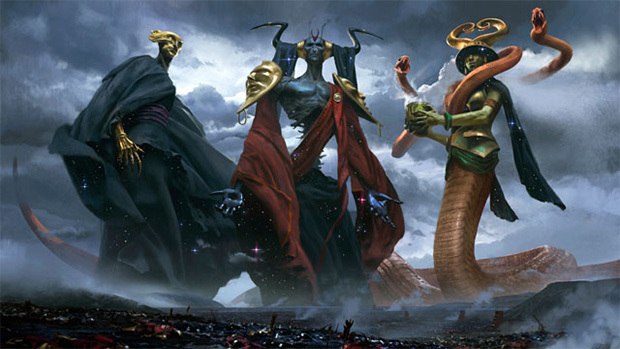 So when trying to determine how to tackle Greek mythology for Theros, R&D designer Ethan Fleischer wrote a short book called Classical Mythology in Magic: The Gathering, which he described a few months ago in an article on adapting the mythology to Magic. While we don't have room to share the entire book today, Ethan went through a pretty cool exercise where he figured out what colors many of the best-known Greek gods would be if transported into the world that ended up being Theros. See if you can guess how Ethan thought the Greek Pantheon matched up with Magic's five colors, then click to reveal Ethan's take on each of the gods. Note that not even Ethan thought he got them exactly right! If you need a hint, click on any of the gods' names to learn more about them. Red, White, and Blue: The king of the gods' domain is the sky; his perception of fate is acute. However, his weapon is the thunderbolt and he is ruled by his passions, especially in love. In the later tales, Zeus is also an arbiter of justice, watching out for all of the people. White and Red: Hera is the wife of Zeus and the goddess of marriage. She is filled with rage at Zeus's peccadilloes, and takes vengeance upon the women he dallies with. Blue: Poseidon is the king of the sea. It's pretty straightforward. Black, Red, and Green: Dionysus is a fertility god and the god of wine. He is the Greek version of Baldr in that he dies and is reborn. He is killed many times in many stories, but always comes back to life. He is also a source of chaos, as his drunken followers, the maenads, rampage through the land, tearing people to pieces and eating them raw. White: Apollo is strongly associated with the sun, with archery, with truth-telling, and with healing. Green: Artemis is the goddess of the hunt. While her twin brother, Apollo, is of the sun, she is of the moon. Blue and Black: Hermes is the messenger god and the patron of thieves. He also conducts the souls of the dead down to the Underworld. Blue and Red: Athena represents the glorious aspects of warfare. She is the goddess of the city, particularly of Athens, and benefactor of civilization. Red: Ares is the horror of war, bloodlust, cowardice, and slaughter. The Greeks abhorred him but the Romans loved him. Red: She is the goddess of love and of beauty. Blue and Red: Hephaestus is the smith god, the artificer. He lives in volcanoes and makes the most cunning inventions. Black and Green: Demeter, like Dionysus, is of both life and of death. During the months each year that her daughter, Persephone, is with Persephone's husband Hades in the Underworld, Demeter lets the plants die. When Persephone returns in the springtime, Demeter makes the plants live again. Black: Hades is the king of the dead and ruler of the Underworld, where the spirits of mortals go.